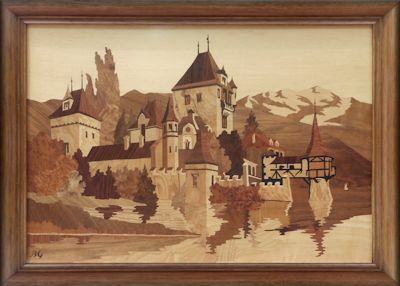 Our September update features some really excellent examples of the ever popular Heidelberg view and Oberhofen Castle pictures by the Buchschmid and Gretaux Wood Inlay Company.. There is also a truly wonderful example of the B & G Four Seasons Coffee Table. 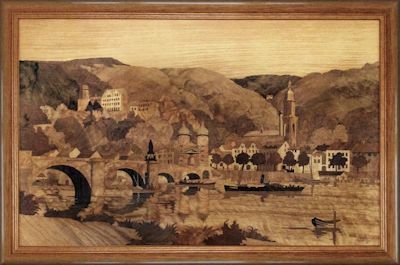 Our September update features the wonderfully picturesque view of Heidelberg and Oberhofen Castle by the Buchschmid and Gretaux wood inlay company which is currently owned by Maia Mittelsta. We have written about these beautiful designs several times before. Indeed, if you check through our Can We Help? pages you will find quite a few examples of these design. 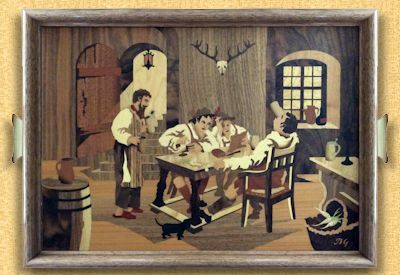 However we also feature a fine tray by B & G featuring the Bavarian Tavern scene. This is the first B & G tray we have seen with this design on it - and very nice it looks too. 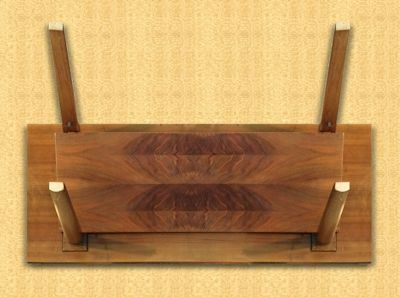 Next we have a really well kept example of the Buchschmid and Gretaux Four Seasons Coffee Table. After carefully scrutinizing the possibilities of a scenery for the specific requirements of inlay work Mr. Gretaux first designs the contours of the picture on transparent paper, in lines only, without shadows. Blueprints of this drawing are then cut apart into all the pieces which later in the finished product will show the different wood colours. Each one of these pieces of blueprint is then pasted onto a selected piece of the right veneer taking care of desired grain structure and direction, and on a jig saw cut to the exact shape according to the confining lines on the blueprint. 10 to 25 different veneers and 120 to 300 pieces in all, are used for one picture. With tables the amount of pieces could be up to 1000. After cutting these pieces are assembled by gluing them onto a piece of paper in the reverse sense of the intended picture. Both this paper and adhering pieces of veneer are turned upside down and the veneer side, under heat and pressure, glued onto a basis plate with precisely uniform thickness, while simultaneously a compensation veneer is glued onto the backside, thus forming the visible reverse side. After this gluing process the paper layer that shows now on top is carefully sanded away. Under it there appears the reverse picture in the reverse sense, i. e. same as the original drawing. The wood of the veneer is then sealed off against environmental influences in a way that the wood pores still show, and with them an inimitable feature of genuine wood. For tables a slightly different procedure completely seals the surface against attacks of spilt alcohol and other liquid, here the pores disappear under the finish, but the silk-like impression of the pictures surface is maintained. Then the picture is framed, isolated against humidity seeping in and there is the finished product. Every­thing is handwork of the highest skill, all materials are of the very best quality available, all colours are natural wood shades with occasional sand burns for rounding effects. Click the above button to return to page 65 of "Can You Help"